Angels have been portrayed throughout time and across cultures as figures who mediate between the material world and the realm of the spirit. They minister to humans, helping to fulfill their God-given potential. Wings are a favorite motif in my art. 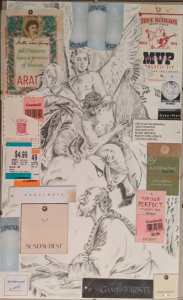 Angels span cultural boundaries and make for a versatile subject. 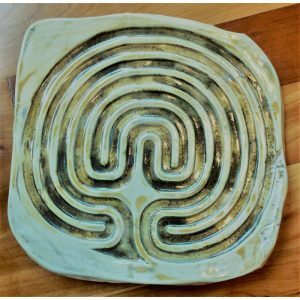 The labyrinth pattern is an archetypal form of spiritual journey found all over the world. I've walked a labyrinth for many years and I find them to be a helpful reflective method. This ceramic version allows meditation at your fingertips as the path is traced and handheld. The form is weighty enough to require careful consideration, and the individual should be sensitive to how fragile it can be. This is like the path of each person’s spiritual growth, different yet possessing challenge and reward. The forms are all handmade in high fire clay and fire unevenly….some have cracks and even warp in the process. Please allow for the flaws in each piece. As far as I know, this is my invention. I have collected tags for decades. Many are necessary and informative. All are mass produced to convey messages. Like the articles they are attached to, they can be combined for emphasis or to signal something novel. 3.) The hole on the tag must be present to prove that it is indeed a tag!